We spend so much time at the office its only natural that we start to fall into certain habits. This is where our mouse goes, that’s how my computers always been set up, etc. When you spend so much of your time at work focused on daily tasks it can be easy to miss simple opportunities to make your workspace more efficient and better for your health and body. Extra items should be removed from the surface of your desk. The only things on your desk should be those that you use frequently. 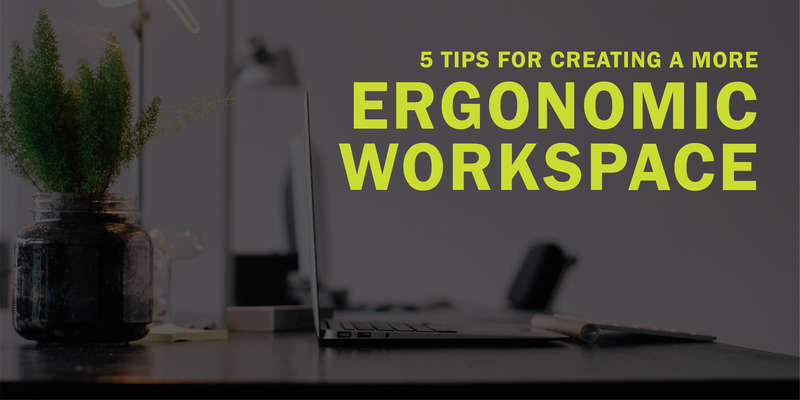 Other items can cause distractions and hinder your space from being the most ergonomic. Your keyboard should be placed close enough for your elbows to be at your side and either flat or angled downward. Avoid using any built-in keyboard stands. Your mouse should comfortably in your hand. Bonus points if you get an ergonomic mouse that limits the movement of the whole hand. Your screens should be right next to each with the secondary screen off center or if you use both the same amount then center them. Your eyes, when looking straight ahead should meet the address bar. If not adjust, the height accordingly. Make sure all your screens are at 10 ° or 20 ° angle and 20”-30” from your head. Whether you are looking for a new office chair or a way to improve the way you are sitting in your existing chair, following these steps will certainly help. If your chair doesn’t have lumbar support built in, bring in a pillow or pad to help support your back. It should follow the curve of your lower spine. As for positioning, sit three to four finger widths from the edge of the chair to your legs and with your feet on the floor. If your feet don’t comfortably meet the floor you might want to consider getting a footrest. Whether you have the option to work at a standing desk or not, don’t forget to take breaks from being in a seated position. Doing this once an hour will help keep the body stretched and limber. It increases blood flow to the brain! If you’re ready to take charge of your career path in the same way you’re tackling the efficiency of your workspace, take a look at our jobs page, we’re hiring all around the country.